A while back we featured the new livery for the contract fleet that used be operate under the Plymouth Citycoach banner. The livery has now been finished off with a new 'wrap' advert for coach tours. It is an improvement and it should help to promote the tours, but I personally feel the banner could have been a bit larger? 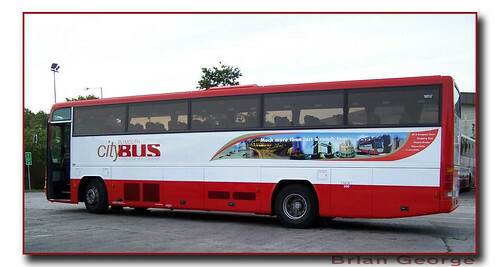 Apart from that though it does connect well with the rest of the Citybus fleet / brand and is very clean and tidy. Have since been informed that this banner will only be used on the main tour fleet which will continue to feature the City Coach fleet name, which takes up more space, hence the smaller banner. It is still a trial run so may change slightly in full application - we will have to wait and see!